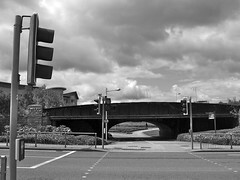 Posted by Stuart Herbert on May 24th, 2010 in Cardiff, Junction Canal, Leisure, Modern, Photos, Shoot. 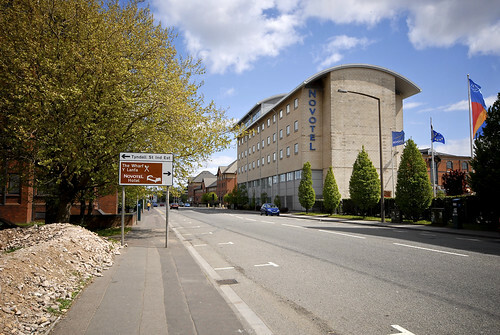 This is the Novotel Hotel on Herbert Street, Cardiff. It looks north out over what was (until recently) the Tyndall Street Industrial Estate, and south it overlooks the surviving Junction Canal, which linked Sea Lock Pound with the two Bute Docks. Posted by Stuart Herbert on May 14th, 2010 in Cardiff, Coal, Historical, Junction Canal, Photos, Shoot, Taff Vale Railway (Modern-day Valley Lines). 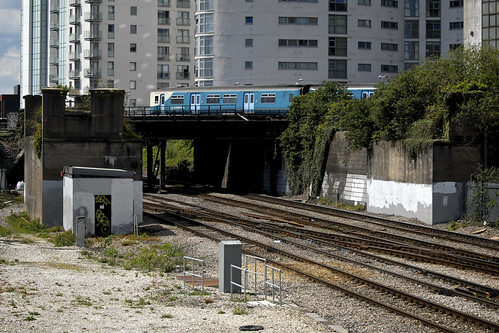 If I have this right, the abandoned bridge towers in the foreground of this shot are all that remains of the TVR railway tracks that carried trains down from Cardiff Queen Street station to the eastern bank of the Bute West Dock. 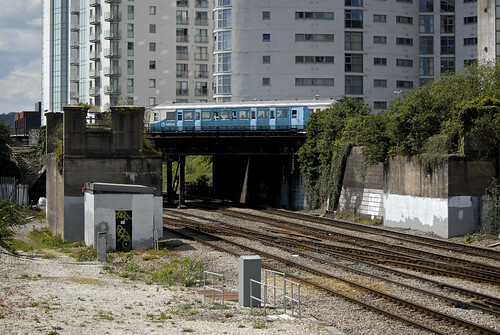 Today, none of the track survives; the area south of here was until recently Tyndall Street Industrial Estate, with Cardiff’s Little Venice (the Atlantic Wharf housing development) beyond it. The surviving bridge tower has a personal significance to me. 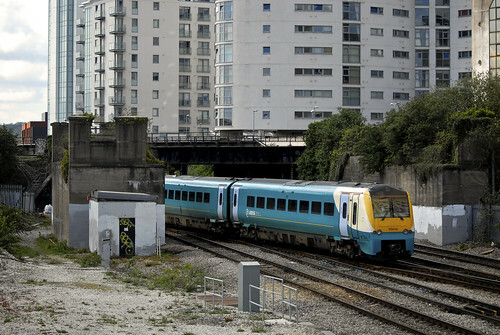 It’s my waypoint on the way home every evening, telling me it’s time to pack up my things because we’re about to pull into Cardiff Central beyond. I couldn’t decide on which of these three photos I preferred, so I decided to post all three. Posted by Stuart Herbert on June 27th, 2007 in Bute Docks, Cardiff, Coal, Historical, Junction Canal, Merthyr Road, News, Taff Vale Railway (Modern-day Valley Lines). (I’ve only just come across this – I hope John will forgive me for being remiss at moderating the backlog of comments awaiting approval. I get a lot of spam, mostly because of how heavily read my blog was back when I worked on Gentoo Linux). If I could have one wish, it would be to take my MacBook Pro, my Nikon D200 and the whole GPS satellite system back in time to visit the places I write about back when they were more than the mostly-lost memories that they’ve become today. I’d love to be able to see what the docks were like before the Glamorganshire Canal was emptied by an unfortunate accident in 1951. I’d loved to have walked under the Walnut Tree Viaduct before it was dismantled in 1969. Heck, I’d have even loved to have seen the old power stations that have completely disappeared from Taff Vale. Fortunately, there are folks on Flickr who are sharing their photos from these times. It’s an act of generosity that I really appreciate. I just hope the generation that follows us all one day learns to understand and respect the history of South Wales that we’re all trying to preserve before it’s gone forever. John Briggs is one of those people kindly sharing their photos on Flickr. John’s photos, from his book Before The Deluge: Cardiff Docklands 1970’s, provide an excellent snapshot of life in the docks some twenty years after the Glamorganshire Canal had finally closed, and after the Bute West Dock too had closed. Two photos in particular caught my eye this evening whilst taking a first look through John’s work, because they provide more information about the Junction Canal that still survives today. 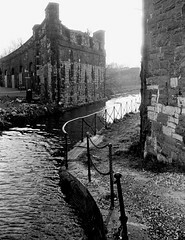 Junction Canal to West is a great shot of the Junction Canal that used to link the Bute East Dock, the Bute West Dock, and Sea Lock Pond on the Glamorganshire Canal. 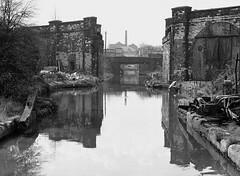 The railway viaduct in the foreground is the Bute Viaduct, which carried trains across the Junction Canal to the western ank of the Bute East Dock. You can see more of John’s photos up on Flickr, or pick up a copy of his book Before The Deluge: Photographs of Cardiff’s Docklands in the Seventies.